Windows Phone 7 launched last fall, but without CDMA support a vast majority of users in the US have yet to be exposed to the complete overhaul of Windows Mobile. 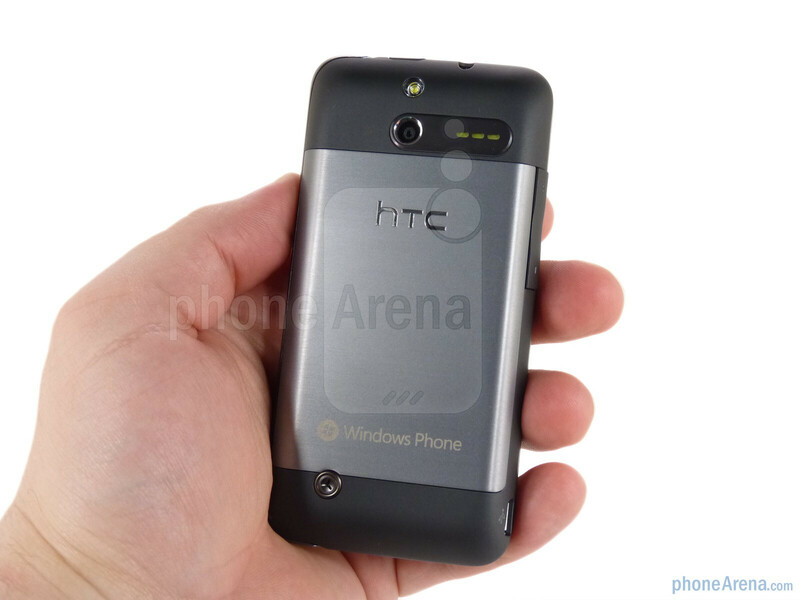 This drought has come to the end with the launch of the HTC Arrive for Sprint. 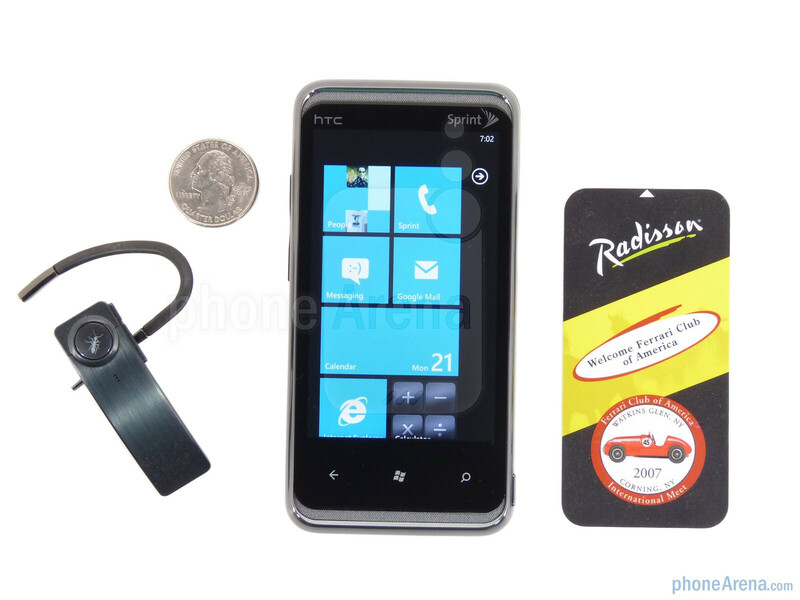 Though this is the first CDMA Windows Phone 7 (WP7), it is middle of the pack in terms of features. That said, all WP7 devices are generously spec’d so the Arrive is hardly underpowered. Featured specs include a 1GHz Snapdragon processor, a crisp 480x800 3.6” display, 16GB of storage and a 5 megapixel camera with flash capable of recording 720p HD video. 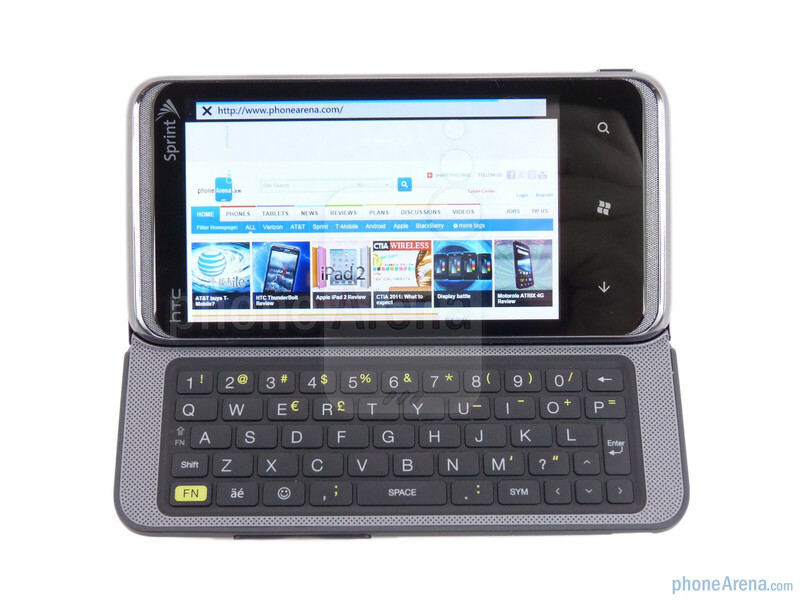 The HTC Arrive also comes with the latest version of WP7, allowing users to copy and paste. Included with the Arrive you’ll get a 1500mAh battery, microUSB cable and AC wall adapter. At first glance the HTC Arrive is very similar to the HTC EVO Shift 4G, but after just a few minutes of using the Arrive it is apparent that the quality is higher. For starters the materials used are better. The EVO Shift is by no means poorly constructed (quite the opposite) but the HTC Arrive is just extremely well put together. The two phones share a 3.6” WVGA display, but the Arrive has 16 million colors to the Shift’s 65K. 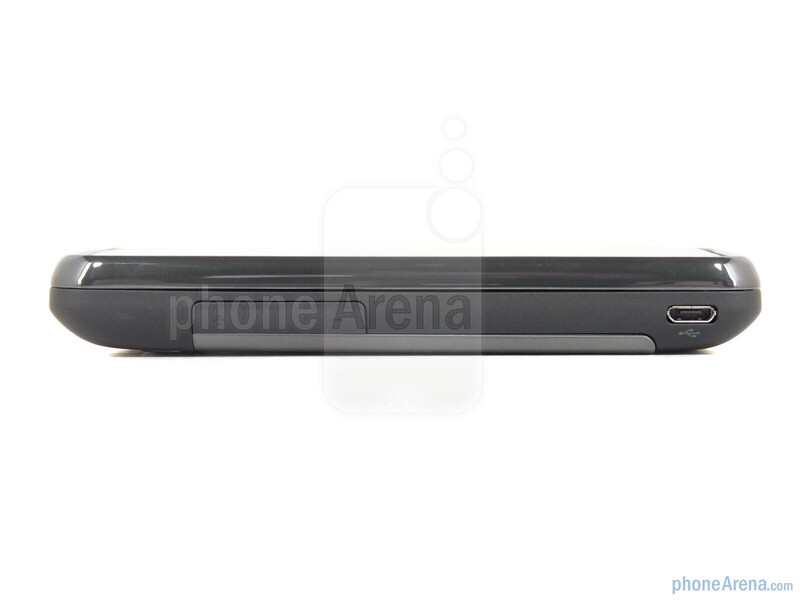 The Arrive has the 3 capacitive WP7 buttons below (Back, Home and Search.) HTC has long been making subtle design touches, and with the Arrive it is a matching mesh grill above and below the display. Nothing major, in fact most people wouldn’t even notice, but we appreciate the attention to detail nonetheless. You can compare the HTC Arrive with many other phones using our Size Visualization Tool. The metal battery door is a nice touch, and another little detail is that the notch to open it is only accessible when the slide is opened, preventing the door coming off when in your pocket or a bag. The gunmetal grey door contrasts with rest of the dark grey soft touch backing. 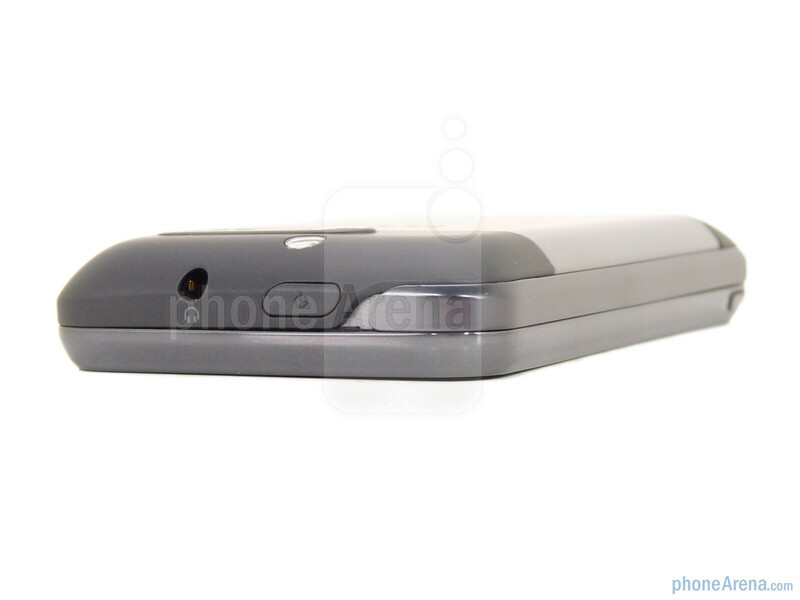 At the top is the 5MP camera and LED flash, and a good looking speaker to the right of the camera. 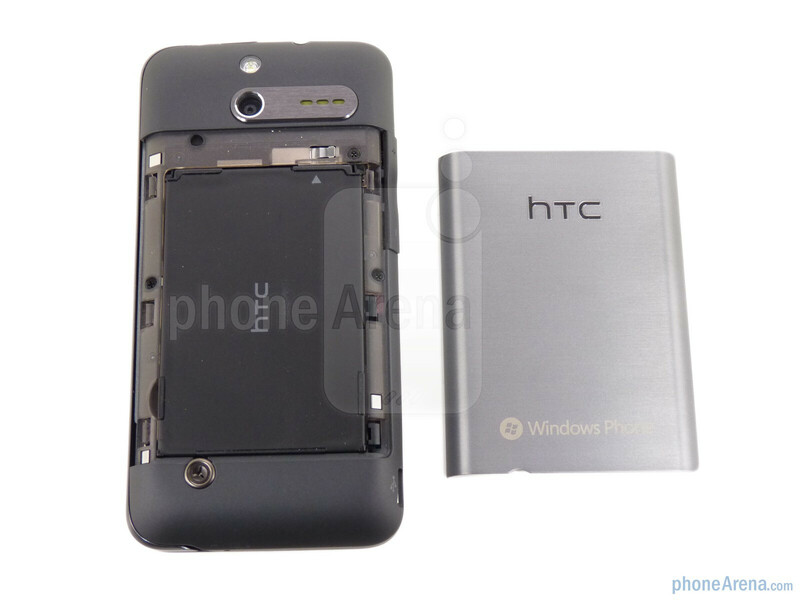 Near the bottom of the phone is a single screw that overlaps the battery door (it doesn’t interfere) that adds an industrial touch to the HTC Arrive. 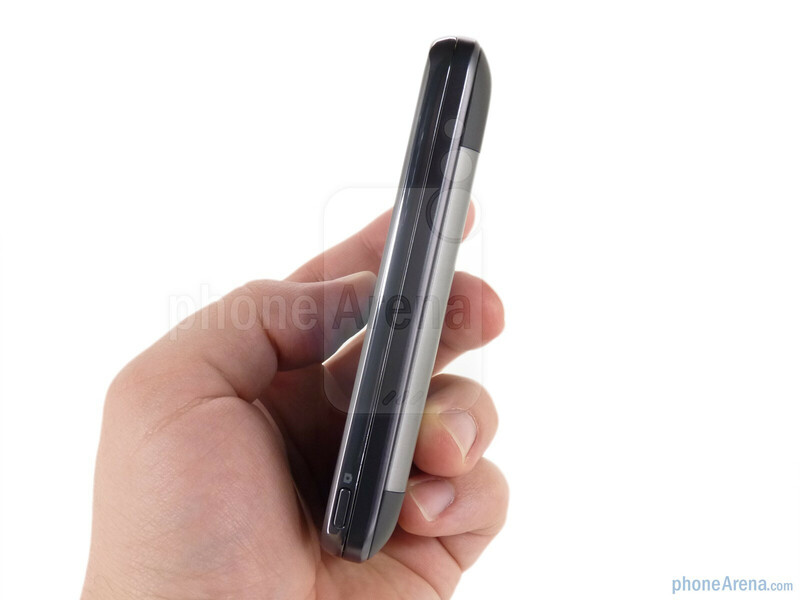 The right side of the Arrive simply has the camera button at the bottom, to the left is an uncovered microUSB port and the volume rocker is towards the top of the left side. 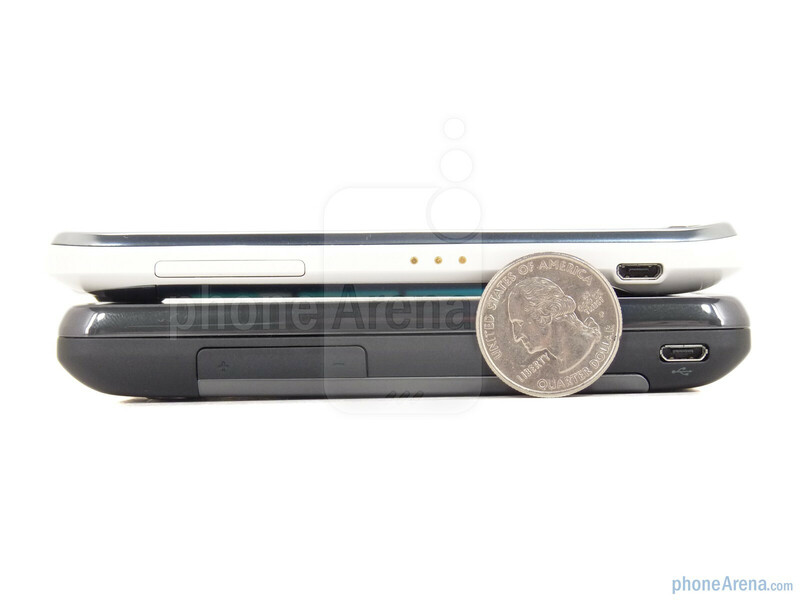 The Arrive’s top edge has a 3.5mm headphone jack and the power button. 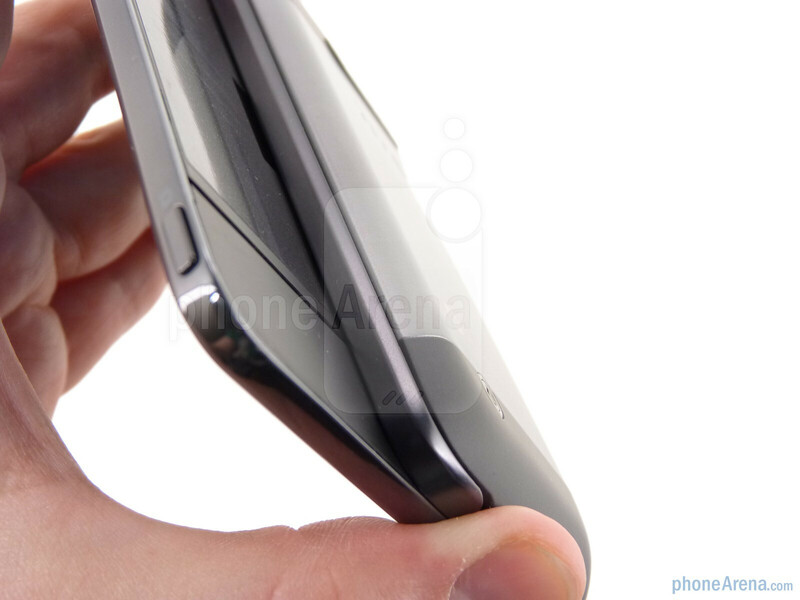 When you slide the Arrive open the top half comes to rest in a notch. 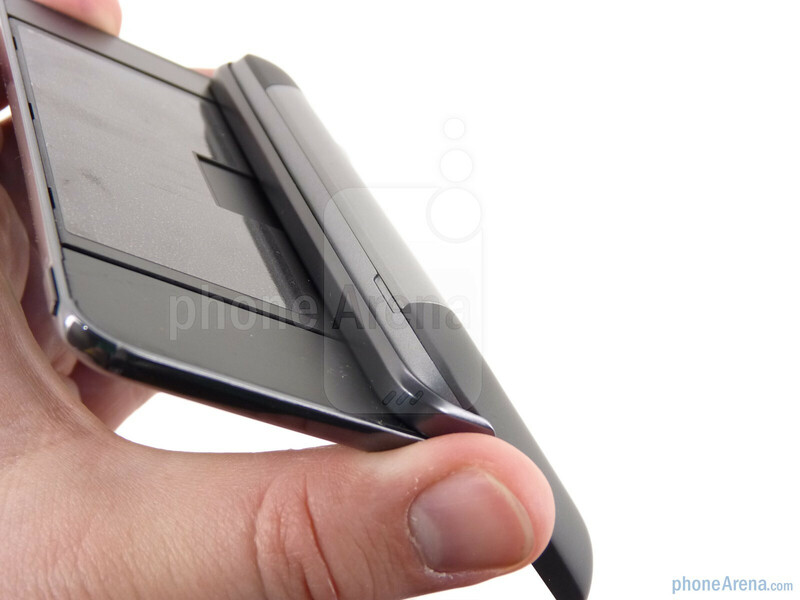 This serves to make the phone sturdier when opened because it is anchored better, and also serves to prevent the slider from trying to close when it is just bumped a bit. It’s a very cool trick and we love the feel of the slide, mostly because of this nifty mechanism. 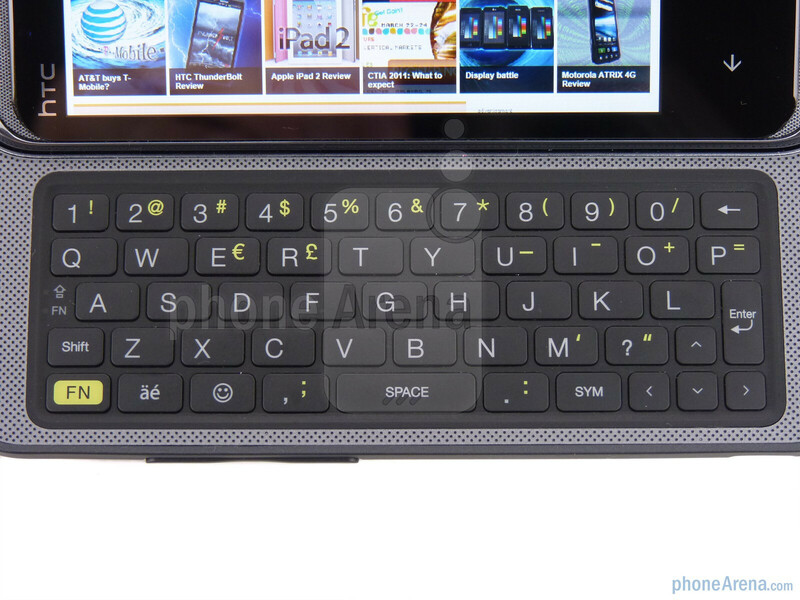 Opening the HTC Arrive exposes the 5-row QWERTY keyboard. The tactile feel is much like the EVO Shift 4G, but the usability of the Arrive’s keyboard is much better. The keys are sized perfectly, and even though the Arrive has 5 rows to the EVO Shift’s 4 rows it does not feel cramped at all. We appreciate the extra keys and were typing out messages quickly from the get go. All around the HTC Arrive is very well put together. In fact, EVO Shift users will probably be jealous because just about everything on the Arrive is designed better than the Shift. HTC has made its name by building high quality handsets and the Arrive wears the HTC moniker proudly. Im sure the OS is far better than Android, but really it just looks like a slightly reworked KIN OS. Too ugly for me. They were not impressed with the Email, integration, lack of ability to customize it, thought the camera was only fair, didn't like the Zune, and people said it was one of the worst devices they tested on calls for some time. It got an "8". 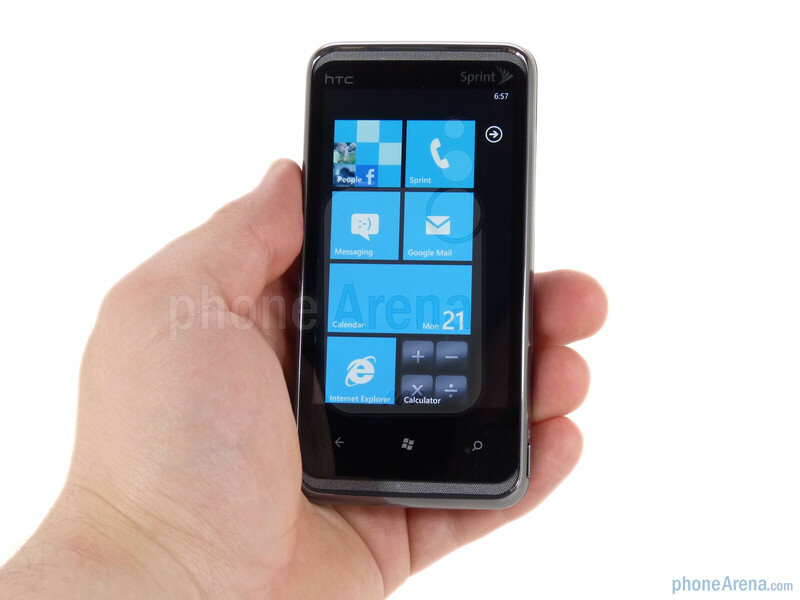 Hey, I am a HTC fan myself, and am starting to warm up to WP7, but if this phone is an "8" after that review, what would it take for Phone Arena to pan a HTC smart phone? For it to implode upon touch? I have had this device for a week now and I can say I love it. The phone's feel is sturdy and a little heavy. The layout is smooth the only problem is with the touch buttons sometimes getting tapped during games. The keyboard is very responsive and easy to type on. The screen is gorgeous, movies and pictures are crisp and clear. Its touch response is precise. Windows phone 7 OS is still new and lacking in some features but this update goes beyond copy an paste. The app switching and loading is smoother and less buggy. I have read a review saying the copy and paste was hard, its not. The phone's drawbacks are in the software's lack of landscape mode. It draws back from the phone's keyboard. My other issue is the flimsy feel of the slide mechanism. It feels like it could break if it got caught. 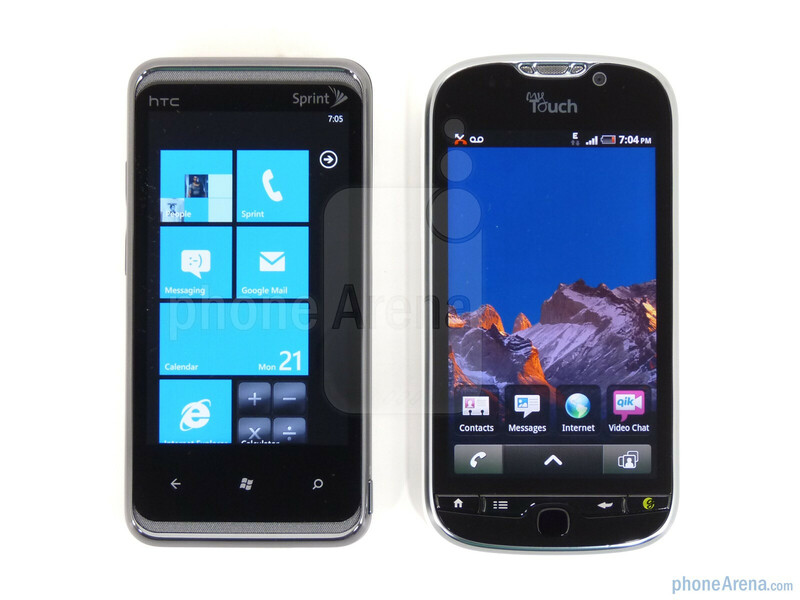 Other than these an WP7 lack of some features its a great phone. shows how inexperienced some of these tech bloggers are. I had no problems whatsoever getting all my music on to the arrive. It is the best mobile device I have ever seen. My first venture in mobile communications was a mobile phone bolted in my trunk that you could fry bacon on (unless CB radio counts as mobile communication). Win7 is a step in the right direction and with live.com, outlook connector, or Windows Office 365, the user will find an email/ calendar/ business contact system. The fast transition between screens and apps is amazing. Apps do not start randomly or devour battery life. No need for app killer or midday charging. Apps are limited to the realm of useful even though there are a bunch of games (no interest to me). This is a positive, I want a device to increase productivity, not waste time. The interface is customizable enough, think Windows OS since 3.5, you could change the entire appearance, but most PC's I see are very similar in configuration. Why create "stuff" people will not use? Has limited version apps of MS office. Handy for tweaking work product when you are caught in down time without your laptop. Yes you can access all the files you care to store on live.com or your Office 365 exchange through OneNote or Lync. Your entire office is literally at your fingertips. Internet, search, and navigation functions are clean and easy to use. Links, phone numbers, and address are recognized by the device and can be accessed immediately. For example, you can tap search button, Bing search for desired location, the device brings up local info on the subject, with options to view the Web or news related to subject. Tap the address and navigation will get you there. Much, much more! 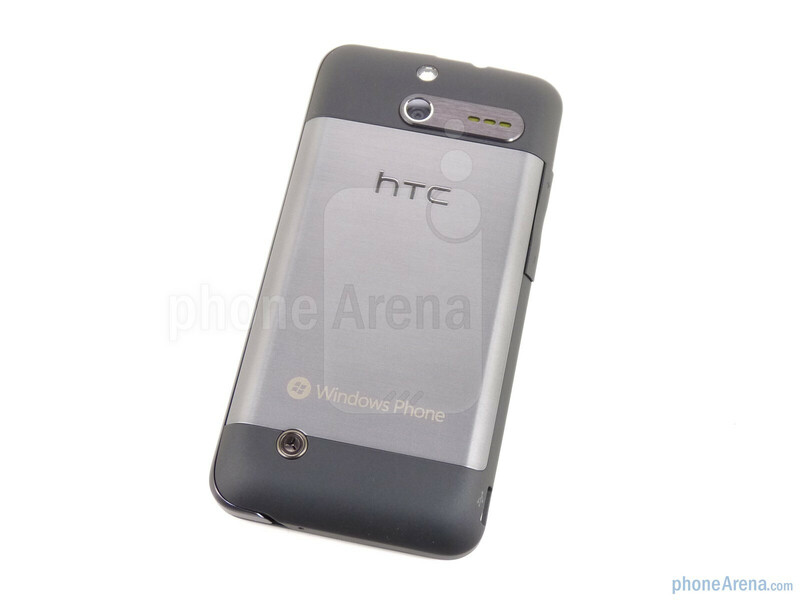 HTC and Win 7, this is a 9.9 just because there is no such ting as a 10.